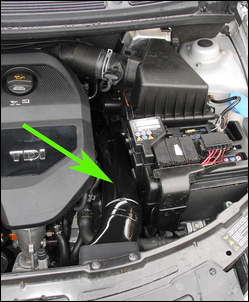 Last issue in Powering-Up the 1.9 litre TDI, Part 2 we finished off the new airbox intake. Now it’s time to turn our attention to the exhaust. The car in question is a Skoda Roomster - but over the years this engine has also been fitted to a wide range of Volkswagen / Audi / Skoda products. Not having modified a late model diesel before, I wasn’t sure what I’d find under the car. Would the 1.9 TDI exhaust have a cat converter? 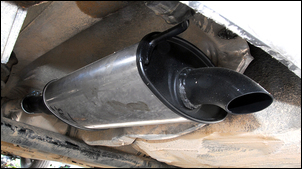 A Diesel Particulate Filter (DPF)? A resonator and a muffler? So no DPF and no middle resonator. Diesels tend to be quieter than their petrol engine counterparts. That’s the case because the exhaust gas temperature is lower and such engines typically use turbos. 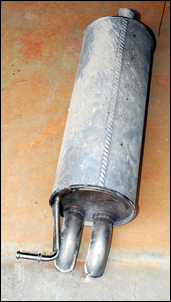 Three components in the Roomster’s post-engine exhaust help quieten it: the turbo, the cat converter and the pictured rear muffler. (By the same token, each of these components also develops back-pressure – that is, acts as a flow restriction). The turbo obviously needs to stay in place, and sticking with the factory cat converter has positive emissions implications – so what about removing the rear muffler? Temporarily taking it off and then seeing how noisy the car is makes for a worthwhile test. 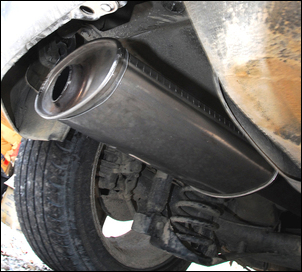 That’s especially the case when you’re dealing with an exhaust like this where the rearmost muffler is the exhaust component designed to do the majority of the silencing. So with the rear muffler removed and the exhaust finishing adjacent to the rear beam axle, how noisy was the car? It was noisier than I wanted and also droned a little at low rpm, but what this test very clearly showed that a new rear muffler wouldn’t need to be very restrictive to achieve the required amount of silencing. I collect second-hand mufflers, especially those fitted as original equipment. 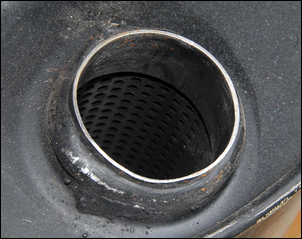 Very often, when people upgrade the standard system, they discard the old factory mufflers – either literally throwing them away or selling them for peanuts. But those discarded exhaust bits work very well on lower powered machines. For example, the mufflers, cats and resonators off a 200kW car will be excellent on a car with (say) only 100kW. As well as being very cheap, the standard items are also often well made in stainless steel. Chopping-up some old bits of tube allowed me position one ex-Jaguar resonator at the end of the cut-off exhaust; the tube offcuts were slipped together to make an assembly that wasn’t perfectly leak-proof but was OK for testing. The muffler was held in place with some wire. I went for a drive and found that the noise level was excellent – in fact, it was hard to tell that the system was non-standard. As newly configured, the trial exhaust had only one major potential restriction after the turbo – the cat converter. I could fit an upsized cat but I wanted to do that only if I hadn’t already made a major improvement to flow via the change in rear muffler. To put this a different way, if the new free-flow rear muffler hadn’t altered performance, only the cat was left as the restriction. The free-flow intake system (fitted in previous parts in this series) made acceleration slower (I assume because the diesel management system isn’t coping with the increased airflow – but wait for the reflash!) and so I was very curious to see what a free-flow rear muffler had done. If the car was slower – fine, another example of more air that the engine management system didn't like, again to be addressed at the reflash stage. If the car was faster – again, fine. But if the performance was unchanged, that implied that the new rear muffler was, to the car, no change at all! The acceleration testing was done and the figures Excel’d. 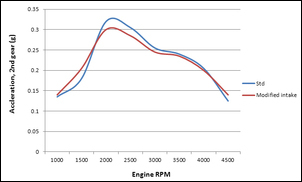 This graph shows the three different conditions – standard, with the new intake, and with the new rear muffler. (Click on any of the graphs to enlarge them.) At a glance it’s hard to see what is going on, but what is immediately clear is that fitting the new rear muffler has resulted in no performance gain. 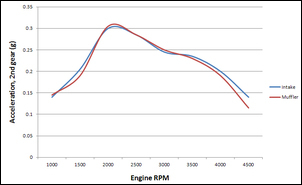 This graph shows the acceleration comparison with the new intake fitted, and with the new intake and new muffler. 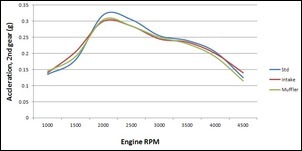 Acceleration is very similar in the mid-range (2000 – 3000 rpm) but at the bottom-end (as the turbo starts boosting hard) and at the top end (where airflow is at its greatest) performance is clearly poorer. If in fact the power is being harmed by added airflow not being coped with by the engine management, this result makes sense. So it would appear that the straight-through resonator has made a difference to engine breathing. The trouble is that, as a result, performance is going backwards. Now it may well be that the new pre-airbox intake is simply really poor when compared with the original - despite the 69 per cent reduction in measured pressure drop at the airbox, and despite the minimum cross-sectional area increasing by no less than 360 per cent. And it may well be that a factory non-straight-through Volkswagen / Audi / Skoda rear muffler flows better than a straight-through Jaguar resonator. But both propositions seem patently absurd. So despite no measurable improvement in performance occurring (at this stage) I went ahead and had the ex-Jaguar muffler fitted. 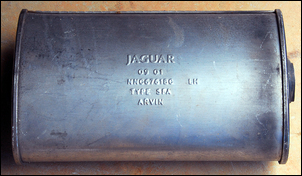 This cost just AUD$40 – since I’d been given the Jaguar muffler, this was the total cost of the modification. In Part 4 of this series: the Powerchip custom engine management reflash.... now we're talking!